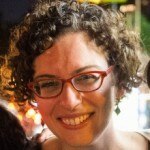 Sarah Litvin is a doctoral candidate in U.S. History at the Graduate Center and teaches at John Jay College. Sarah Litvin comes to CUNY from the Lower East Side Tenement Museum where she worked for five years, eventually as the Senior Education Associate for Exhibit Development. Particular research interests include material culture, disability history, Jewish history, and New York immigration history.